What’s The Most Popular Therapist Billing & Practice Management Tool? For many therapists, business logistics are one of the least compelling aspects of running a thriving private practice. Marketing, managing client notes, and billing all distract from what’s most important — spending time with clients. We at Zencare help on the marketing front, so we were naturally curious about the top tools for billing and practice management. We surveyed and analyzed the results from over 100 therapists across the Zencare community to learn which practice management tools are preferred among therapists in private practice. Read on for our honest, firsthand insight into the most popular tools, including which features therapists appreciate the most, their dream features, and real talk on cost, ease of use, and integration. SimplePractice is the platform of choice! The results are in, and SimplePractice wins! Over one-third of Zencare therapists (34%) surveyed use SimplePractice, making it the number one preferred billing and software management platform for therapists in our network. SimplePractice earned an 8.7/10 satisfaction score among the therapists who use it, with 90% of therapists citing “ease of use” as the feature they appreciate most. Therapists use a wide variety of billing and practice management tools — no one platform has a majority. SimplePractice, Office Ally, and TherapyNotes make up the majority of the market. Altogether, the top three online billing and practice management tools – SimplePractice, Office Ally, and TherapyNotes – account for 61% of all billing and practice management methods used. SimplePractice (34%) captured the lead, followed by Office Ally (16%), and TherapyNotes (11%). Therapists choose SimplePractice and TherapyNotes for ease of use, and Office Ally and paper-based offline systems for cost and affordability. Why do therapists choose each platform? Looks like a trade-off between ease of use and cost. SimplePractice and TherapyNotes in on ease of use. 90% of therapists cited “ease of use” as the top feature for both SimplePractice and TherapyNotes. What makes the #1 choice, SimplePractice, uniquely user friendly? We spoke with Zencare therapists and learned they love the platform’s mobile apps, fully electronic intake process, and user-friendly aesthetics. SimplePractice has both iOS and Android mobile apps – on the iOS app store, it boasts 4,289 reviews with average of 4.7 out of 5 stars. “I like and use the mobile app for SimplePractice all the time,” says Dr. Ruben Hopwood, a Licensed Psychologist in Cambridge, Massachusetts. Aesthetics may also be another reason providers choose SimplePractice – 31% of surveyed users enjoy the overall look of SimplePractice. “The software is easy to use, very interactive, and pleasant to the eye,” says Dr. Sarah Karytko, a psychologist who uses SimplePractice in her practice in Brookline, Massachusetts. TherapyNotes, on the other hand, may not have an app (yet! ), but users seem pleased with the overall product. “I have used Therapy Notes for over one year, and have been very pleased with both its functionality and user friendliness,” says Jamie Bloom, a Licensed Clinical Social Worker in Brooklyn, New York. Office Ally and other free tools win on cost. Three-quarters of therapists indicated “cost/affordability” as the top thing they like about Office Ally. That compares to a base fee of $39-$49/mo for SimplePractice and $49-$59/mo for TherapyNotes — and that’s before additional fees for claims processing, credit card fees, and added features like tele-therapy. Similarly, therapists who use their own systems or paper-based systems choose that route for the cost benefits. Claudia Giolitti, a Licensed Psychotherapist in New York City, uses G-Suite’s Google Sheets for her practice. 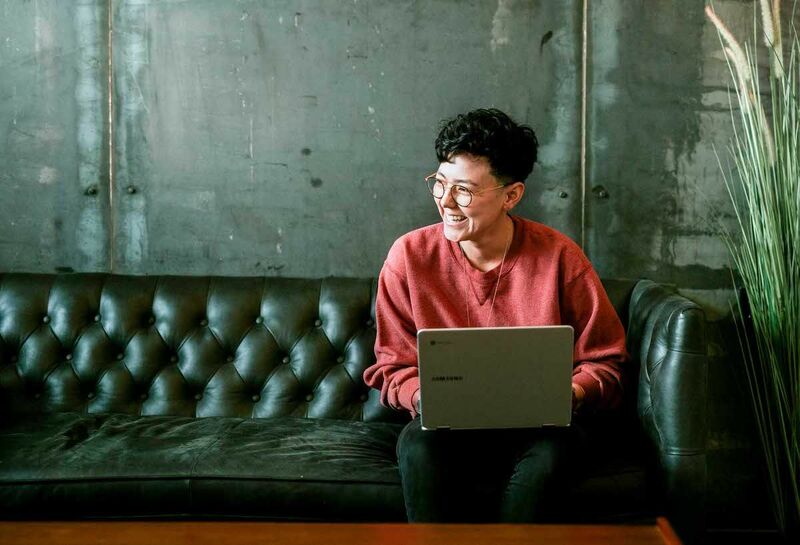 G-Suite is the business-oriented version of Google’s products, and offers the option to sign a Business Associates Agreement (BAA) to be HIPAA secure; Google Sheets works like Excel, allowing users to build and manage spreadsheets. Therapists are generally happy with their choices! Have therapists mastered the art of being happy? For the most part, they’re content customers! Nearly half of the users of the top three online platforms indicated they were overall satisfied with their platform of choice. About half of therapists using Simple Practice (47%) indicated they were overall satisfied and didn’t have any complaints. 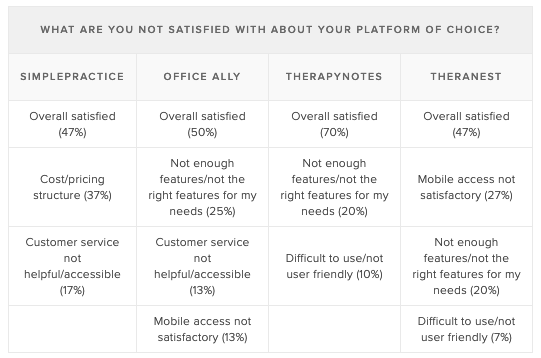 Just over one-third of users (37%) wished the platform were more affordable, followed by 17% of therapists who found the customer service not helpful or accessible. Dream features: therapists wish their platforms had secure batch emailing, the ability for clients to upload documents, and more practice branding capabilities. Billing and software tools might want to take note: Therapists have plenty of ideas for improvement! Paper-based, offline systems is still the #3 choice! Is paper-based management a thing of the past? Not yet, it seems – of surveyed therapists, 13% indicated they either manage their billing offline or with a paper-based system. This makes paper-based management #3 in the preferred options, between Office Ally (16%) and TherapyNotes (11%). Fun shoutouts: One therapist shared that their “husband does my billing” and that they prefer this method because “he doesn’t make mistakes and follows up on late reimbursements.” We’re loving the teamwork! And one respondent had “self-created” their own platform – entrepreneurial spirit right there! Very few therapists outsource to a billing professional. Despite their busy schedules, almost all surveyed therapists managed their own billing and practice management, with only 4% working with a hired billing professional. The #hustle is real! Therapists across NYC, Boston, and Rhode Island have similar choices when it comes to practice management platforms – but Rhode Islanders are a bit more diversified in their preferences. Do preferred platforms differ by geography? Results didn’t differ much across the three surveyed regions, with very slight differences in the order of top platform. For NYC therapists, SimplePractice won over a third of therapists (37%), followed by offline/paper-based (16%), Office Ally (14%), and TherapyNotes (9%). Almost half of Boston therapists showed their allegiance to SimplePractice (45%), followed by Office Ally (20%), offline/paper-based (15%), and TherapyNotes (10%). Rhode Island therapists were more distributed in their preferred methods, with the most popular option, SimplePractice, capturing less than one-third of therapists; this was followed by Office Ally (15%), a tie between TherapyNotes and Therapy Appointment (13% each), and offline/paper-based (8%). Conclusion? SimplePractice wins on ease of use and abundance of features, Office Ally wins on cost and affordability, and TherapyNotes may be an underrepresented gem – with a paralleled satisfaction score to SimplePractice. Learn more about each billing and practice management platform through our analysis of features and costs for TherapyNotes, TheraNest, Office Ally, and SimplePractice, including reviews by Zencare providers. Here’s how to choose between SimplePractice vs. TherapyNotes, and a comparison of therapist billing and practice management platforms, too. Starting or looking to grow your private practice? Join the Zencare therapist network to be a part of a supportive community of vetted providers! You can ask questions via our active email listserv, build a professional online presence, and receive referrals for clients who are a great fit your practice. Schedule a free call with our Therapist Success Team today to learn more. Our survey was sent to over 500 therapists in the Zencare network in New York City, Rhode Island, and Massachusetts from January 18 to January 21, 2019. Our analysis was conducted on the 102 responses we received from providers.